How the zebra got its stripes might at first seem like an esoteric question. But it has fascinated many generations and is embedded in the lore of Africa. It is also a question that offers a great educational tool by helping the general public understand how evolution shapes the variation we see in nature. I began studying the question out of pure curiosity. But could it be more? Could the answer to why zebras are striped provide any benefits to society? There are many ideas about the advantages that stripes might confer on zebras. Three ideas have some support: that stripes help zebra escape predation, avoid biting flies, and keeping cool. I’ll take up each of these ideas in turn, while speculating about the societal benefits that could obtain if they were proven to be true. The most well-known idea about why zebras are striped is that they help them escape predation. The thought is that the dazzle effect of their stripes confuses the predator about either distance, speed, direction of movement, or where one zebra ends and the other begins. The dazzle effect has already been put to use. In the first world war, ships were painted with bold black and white patterns in the hopes of making them less vulnerable to attack. Research is mixed as to whether stripes actually lend such an advantage to zebras or might instead make them easier to catch. Once we understand whether stripes make something harder or easier to capture, rest assured that technology will make use of the fact. It has also been suggested that zebra stripes keep disease-carrying flies, such as tsetses and horseflies, from biting. Nagana, a form of sleeping sickness carried by tsetse flies, is a serious deterrent to livestock rearing in parts of Africa. Much research has gone into trying to mitigate this problem. Researchers are working on not only why zebras are striped, but how. By trying to work out the genetic basis, we might one day be able to breed zebra-striped livestock. I can just see a herd of zebra striped cows contentedly munching away in a swarm of confused tsetse flies. This solution for livestock would be a double-edged sword, though. The inability to rear livestock is one reason some areas of Africa are safe from human encroachment and are left for wildlife. At any rate, the waterbuck may have already stolen the zebra’s thunder. Researchers have discovered that waterbuck give off an odour that deters tsetse flies. Collars exuding this smell are now being developed for livestock to wear. This is very much like your dog or cat wearing a flea collar. There is another idea about the function of zebra stripes that could have an impact on their survival, and could possibly benefit humans and the rest of the planet. Collaborators and I recently discovered that the strength of striping in one species of zebra, the widespread plains zebra, varies with temperature. The more stripy zebra are found in hot, tropical climates. Preliminary experiments also suggest that strong black and white stripes may help keep zebras cool under the tropical sun. If the biting fly hypothesis is true, temperature may also influence how many parasites they carry. Clearly this matters for zebra in the face of climate change. Zebra in regions of Africa that have seasonally cooler temperatures have subtler striping and often lack stripes on the legs. 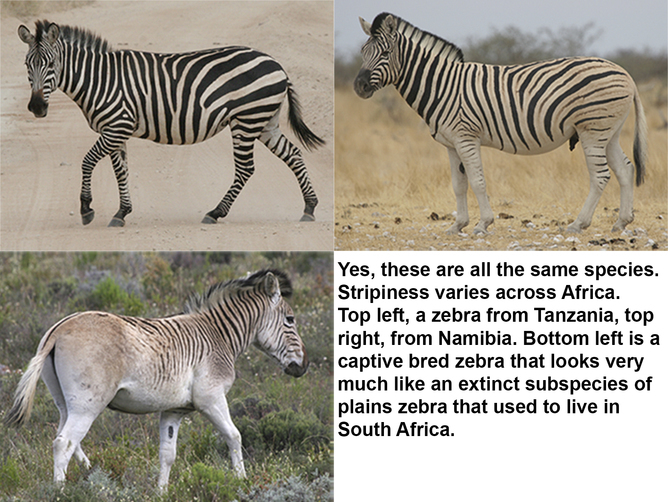 Should climate change render these regions hotter, these less stripy zebras may have insufficient ability to thermoregulate and they may be subject to bites by flies that now harbour more parasites. Either of these could pose serious problems for zebras if their populations cannot evolve stronger striping quickly enough. On a more positive note, if zebra stripes can truly create cooling, imagine an inexpensive cooling system for buildings that requires no energy input once in place. Instead of turning on the air conditioning, just roll out a black and white striped cover onto your roof during hot spells. This could significantly reduce energy usage and help mitigate climate change. Only time will tell whether any of these ideas pan out. Meanwhile, I work simply to satisfy my curiosity, and hopefully yours.